Is Belgrade’s play on Kosovo Partition? It is unlikely that the Kosovo leadership will accept negotiations that reverse its declaration of independence. Thus Kosovo is likely to remain an unresolved issue and effectively block the accession of both to the European Union. Belgrade may be prepared to settle ultimately upon Kosovo’s independence, but probably on terms not acceptable to Pristina, the partition or carving out of the northern part now controlled by Kosovo’s 10% Serb population. In the meantime, is Bosnia & Herzegovina likely to be drawn into the equation as it appears frequently to be someone’s bargaining chip, or more accurately chip to be traded? According to UN News Centre: Kosovo declared independence from Serbia in February 2008, but Serbia does not recognize the declaration. The matter has seen tensions between ethnic Serbs and ethnic Albanians flare up over the years, particularly in the north of Kosovo – which has an ethnic Serbian majority, unlike the rest of Kosovo, where ethnic Albanians are the majority – sparking concerns from United Nations officials. Talks between Kosovo and Pristina have been on ice since President Nikolic’s election this summer. See Amb. Muhamed Sacirbey Interview with France 24 . Is Nikolic Suggesting that Bosnia is also in Play? 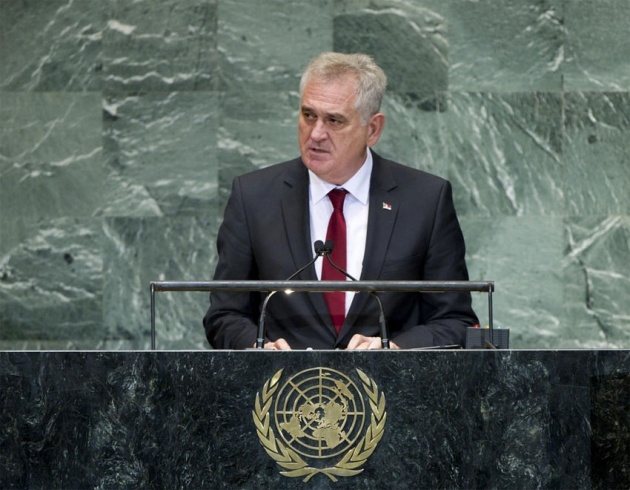 Did Serbia’s President issue a thinly veiled threat against Bosnia & Herzegovina’s territorial integrity and sovereignty? Kosovo, where ethnic Albanians are the majority – sparking concerns from United Nations officials. “I am not a prophet, but I must say that the unilaterally declared independence of Kosovo constitutes a dangerous precedent and a long-standing threat to stability in the region of the Western Balkans and beyond it.” President Tomislav Nikolic did not allude to potential secession of Republika Srpska from Bosnia & Herzegovina, but does this statement imply his Government’s threat if Kosovo’s independence continues to be recognized by mostly western and some Islamic states? Real economic growth is still lagging for the region, but particularly for those states where nationalism feeds the mindset. More needs to be done by the region’s leaders to spur growth, and ultimately each will be better-off with the success of neighbors and mutually beneficial trade/production rather than consumed with jealousy or coveting what is not theirs. Undoubtedly injustice remains and the rule of law is more a rhetorical component of a speech than something truly observed. President Nikolic’s speech may be jockeying for bargaining position. It certainly is likely to play with his more nationalist constituency. Unfortunately it also keeps the mindset of many in the region in the conflicts of two decades earlier and projects a regressive perception of the leadership to its potential European partners.